Through the life of Benjamin Ryan Tillman (1847-1918), South Carolina’s self-styled agrarian rebel, this book traces the history of white male supremacy and its discontents from the era of plantation slavery to the age of Jim Crow. 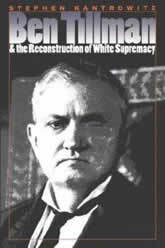 As an anti-Reconstruction guerrilla, Democratic activist, South Carolina governor, and U.S. senator, Tillman offered a vision of reform that was proudly white supremacist. In the name of white male militance, productivity, and solidarity, he justified lynching and disfranchised most of his state’s black voters. His arguments and accomplishments rested on the premise that only productive and virtuous white men should govern and that federal power could never be trusted. Over the course of his career, Tillman faced down opponents ranging from agrarian radicals to aristocratic conservatives, from woman suffragists to black Republicans. His vision and his voice shaped the understandings of millions and helped create the violent, repressive world of the Jim Crow South. Friend and foe alike–and generations of historians–interpreted Tillman’s physical and rhetorical violence in defense of white supremacy as a matter of racial and gender instinct. This book instead reveals that Tillman’s white supremacy was a political program and social argument whose legacies continue to shape American life.